Updated at 4:53 p.m. Eastern. (CBS News) LONDON - An explosion inside the Syrian national security headquarters in Damascus targeted ministers from President Bashar Assad's regime who were meeting with defense officials on Wednesday, killing three of the most senior members of Assad's inner circle, including his brother-in-law. The Syrian Army said Defense Minister Gen. Dawoud Rajha and his deputy, Asef Shawkat, were both killed in the explosion. 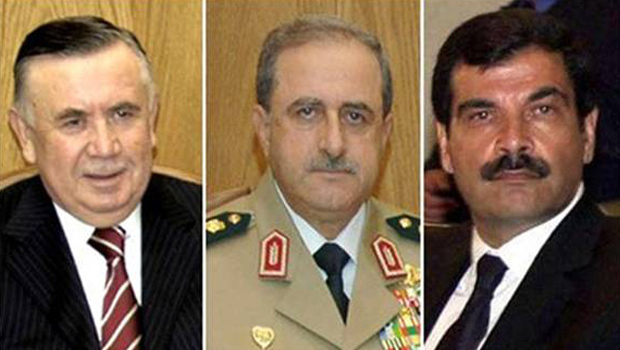 Shawkat, Assad's brother-in-law, also held the title of deputy chief of staff. According to state-run television, former Defense Minister Hassan Turkmani, who headed Assad's "crisis cell" that coordinated the regime's response to the 16-month uprising, was also killed in the blast. Other ministers and military officials were seriously wounded in the explosion, according to state media. CBS News correspondent Elizabeth Palmer reports that in spite of increasing attacks in recent weeks, Damascus had remained a bubble of relative normality in Syria. Wednesday's crippling blow, however, will almost certainly put an end to that image - even among those regime supporters who have tried to ignore the encroaching reality. Fierce gun battles and other explosions were reported around the capital following the attack on the security headquarters, including at least four blasts reported near military installations in Damascus. "The attack makes Syria, its armed forces, people and leadership, more determined to stand up to terror groups and amputate the arm of anybody who seeks undermine Syrian security," the army said in a statement. U.S. Defense Secretary Leon Panetta said the situation in Syria is "rapidly spinning out of control" and "it is more essential than ever" for the international community to broker a peaceful transition of power. To turn up the heat, the Obama administration announced financial sanctions on many top members in Syrian President Bashar Assad's government just hours after the bombing, targeting the prime minister and 28 other Cabinet ministers and senior officials. Opposition leader Kamal al-Labwani told al-Arabiya, a pan-Arab satellite channel, that a member of the rebel Free Syrian Army planted a TNT and C-4-based device inside the building ahead of the meeting, and then detonated the bomb remotely before fleeing to safety. There were conflicting claims, however, from other opposition figures, some of them claiming a suicide belt had been used in the attack. Omar Shawaf, a member of the Syrian National Council, told the AP from Turkey that the attack shows no one in the Assad regime is safe. "The hands of the Syrian people and the Free Syrian Army can reach anyone inside Damascus," he said. Reporting from the scene of the explosion, CBS News' George Baghdadi said the blast did not appear to be very large. There have been previous bomb attacks inside Syria targeting regime officials, but they have been much larger explosions and targeting much lower-ranking members of the government and security forces. The national security headquarters is among the most tightly secured buildings in Damascus. If rebel forces did in fact remotely detonate a bomb, the individual who planted the device likely was an insider. Officials told Al Jazeera that the person who planted the device was one of the cabinet member's personal bodyguards. The armed uprising against Assad's regime has intensified rapidly in recent weeks, with mounting military and political defections eroding his family's long-time grip on power as rebel forces engage his troops more frequently in Damascus, the president's seat of power. The Free Syrian Army announced in a statement on Monday the launch of an offensive dubbed "the Damascus volcano and earthquakes of Syria," reports CBS News' Khaled Wassef. The statement said the FSA had begun carrying out attacks on all security stations and branches in Syrian cities and the countryside. It called for attacks on military forces and pro-regime militia checkpoints across the country, as well as cutting off all international highways. In Damascus, activists reported nearly empty streets as military and police forces stepped up deployments, according to the AP. "It's so empty, it reminds me of when Hafez Assad died in 2000," one Damascus resident said on condition of anonymity. "Everyone is really scared of the coming days, especially tonight, with the possibility that the regime will take revenge." The Muslim Brotherhood, a political party which has risen to new heights in nearby Egypt since the overthrow of President Hosni Mubarak, is the main faction in the biggest Syrian opposition group, the Syrian National Council. The Brotherhood issued a statement Tuesday urging the Syrian people to rise up and back the rebels locked in what the group called a "decisive battle" against Assad's troops in Damascus. Elsewhere around the world, diplomatic wrangling over how to handle the Syrian crisis continued. The United Nations Security Council delayed until Thursday morning a vote on a new resolution after a request Wednesday morning from international envoy Kofi Annan, who has tried in vain to broker a cease-fire between the rebels and government forces, CBS News foreign affairs analyst Pamela Falk reports from the U.N.
Russia, a longtime Syrian ally that has along with China twice vetoed previous U.N. action against the Assad regime, accused Western powers of fomenting conflict. "Instead of calming the opposition down, some of our partners are inciting it to go on," Foreign Minister Sergey Lavrov said, according to RIA Novosti news agency Wednesday.